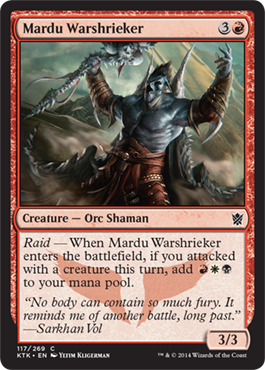 Today, I'm featuring the Mardu in their respect for the speed of dragons. 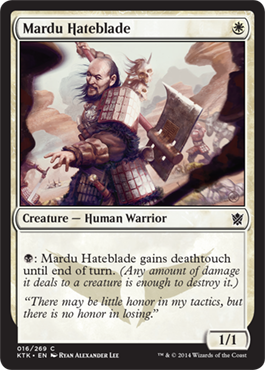 With Mardu, the best way to walk away victorious is to move fast. 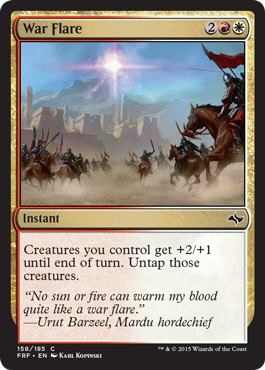 This means creatures with haste, utilizing the new mechanic Dash, and backing up your team of creatures with Raid (the mechanic from Khans of Tarkir, not that brand of insecticides and pesticides). We're moving fast, so keep up! Yeah, I'm just going to get my "Runemarks are great!" spiel out of the way early on. 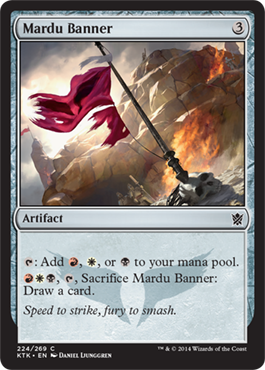 Vigilance from the Abzan one hits with black, but the best and most useful one is obviously the Mardu Runemark. 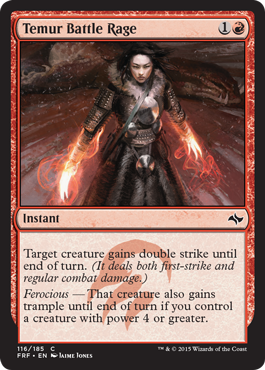 First strike provides the best offense and defense your creatures can have because you want them hitting first, either being the first player to attack, or have damage dealt first. 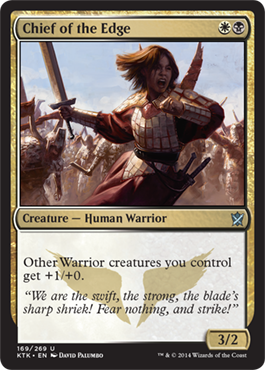 Aven Skirmisher is not just for the Jeskai. 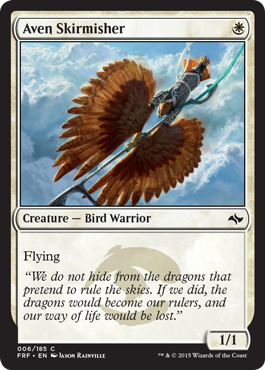 A 1/1 flying creature for one mana is great any day. If you run white, run this. Chances are you'll have one anyway. Pressure Point is good because you tap down a blocker and draw a card. Drawing is for Blue and Red primarily. 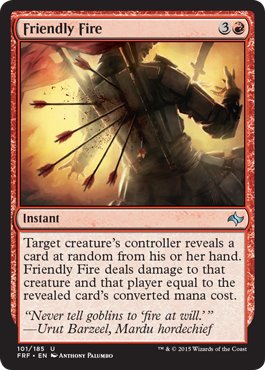 Well, Red forces a discard most of the time it has draw capabilities, so take the free card. Modal creatures. Pretty awesome if you ask me. 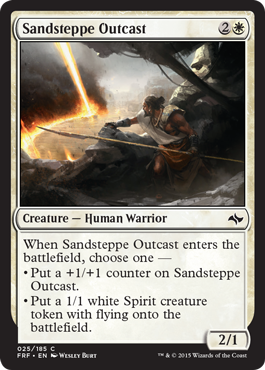 Since there won't be many flying options available in Mardu colors, make it a 1/1 Spirit with flying, please. What did I say about direct damage? 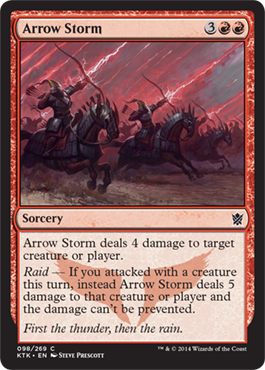 It's a Lightning Helix for one more mana, one less life and one less damage, and it's in the one Mardu color not used in Lightning Helix. 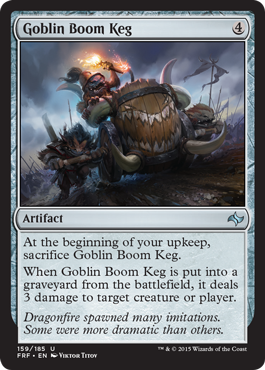 Might not be competitive in Standard, but that's why you use it here. You'll hurt its feelings if you don't. Do I need to explain myself here? Death and destruction everywhere! Lightning Bolt with a twist. 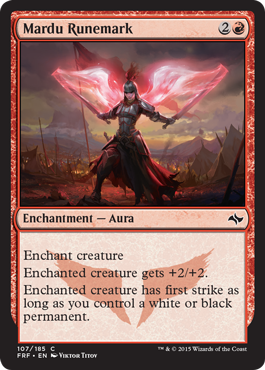 Good in limited, will be good in Standard. 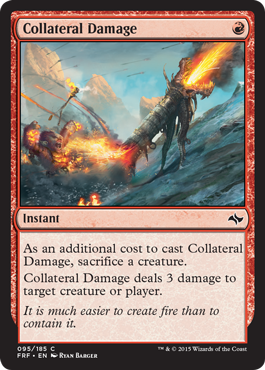 Collateral Damage is very usable. 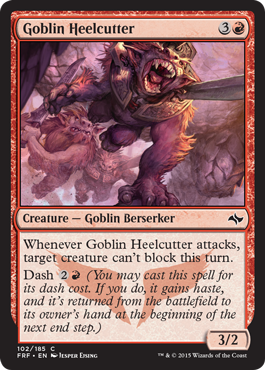 Goblin Heelcutter is probably one of the best Mardu creatures at common. 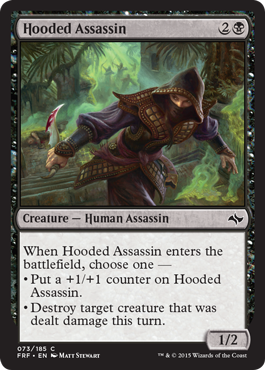 A 3/2 for three mana with haste and it forces a creature of your choice to stay out of combat. 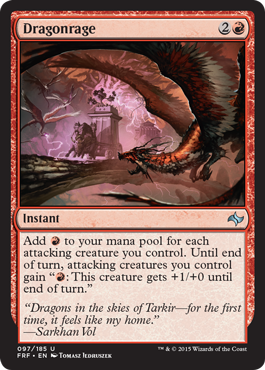 A 5/5 dragon for five mana. 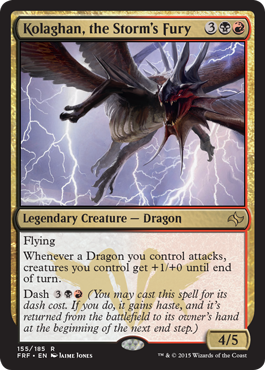 With flying, trample, and haste. Yes, this is good! 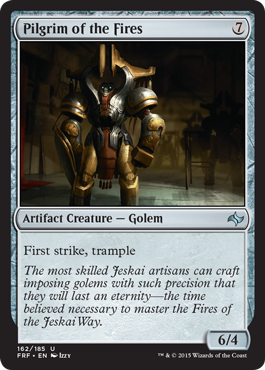 Sure, it's Temur, but we used Abzan ad Jeskai spells earlier in white. 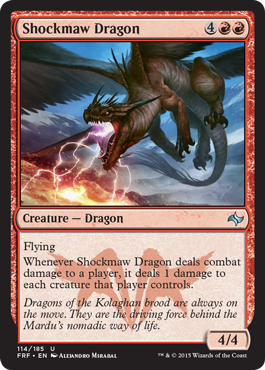 Doublestrike for two mana with the ability to also give it trample with a big enough creature is important. Direct damage again. 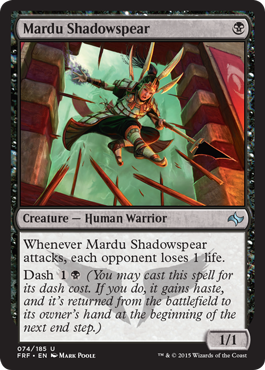 You'll just have to stop using Dash long enough to have creatures stick to the battlefield first, but still a great spell. 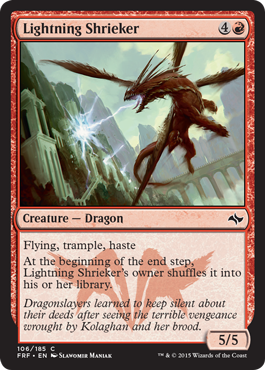 Boost all of your creatures in power and toughness paired with creatures that have first strike or trample is good. 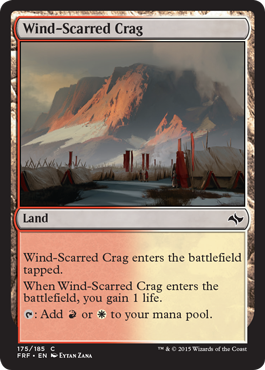 Obligatory dual lands available to you. 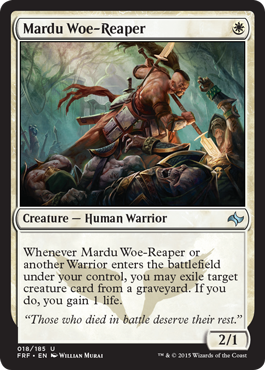 Mardu Woe-Reaper is a good answer to Sultai's Delve. 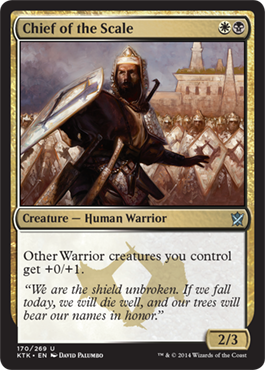 most of your creatures will likely be Warriors too. 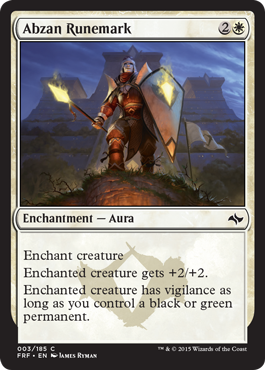 Valorous Stance either protects one of your creatures or destroys an opponent's creature to protect yourself (and your creatures). Either way, It's pretty useful. 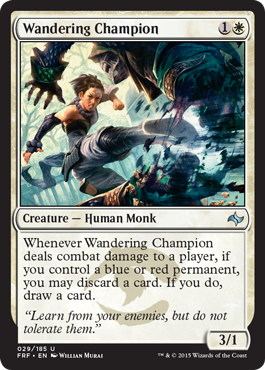 Wandering Champion triggers with red permanents. See, this is red's card draw. Discard to draw. 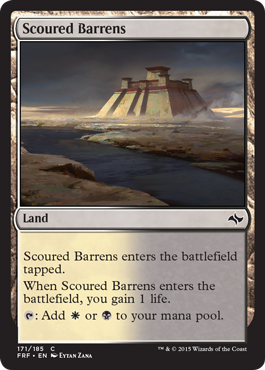 Gets rid of lands if you have too many in your hand. 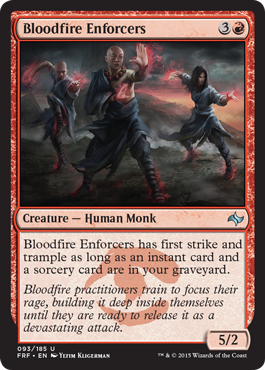 A 3/2 with first strike for two mana is good. See? 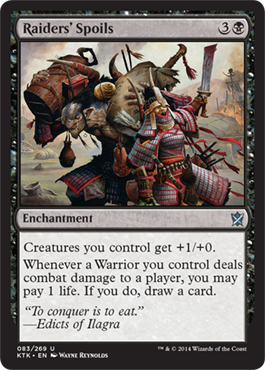 Warrior subtheme. 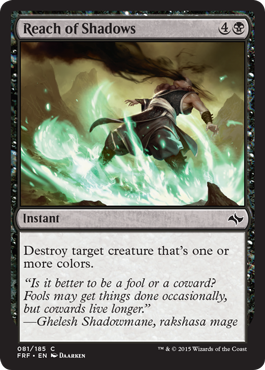 Thoughtseize a card and smack your opponent with two damage. 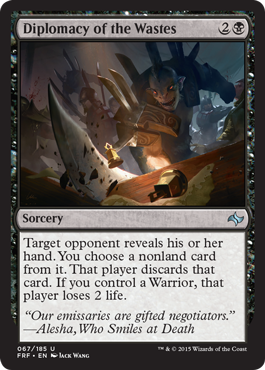 Er... loss of life because it doesn't say "deals" or "damage." 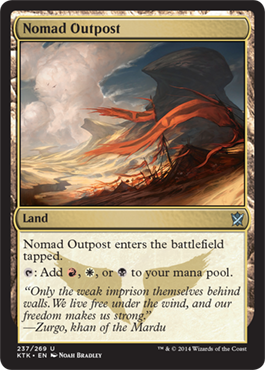 One mana 1/1s are useful for starting fast out of the gate. 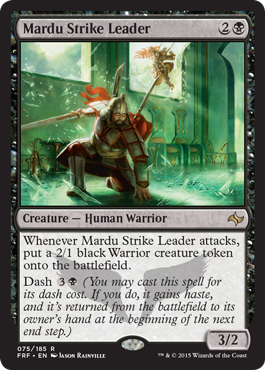 Not sure about Dash on this one, but it means haste, 1 damage and 1 life lost in addition. Seems good. Direct damage and a dragon. Seems flavorful and good. Let's call that "tasty." 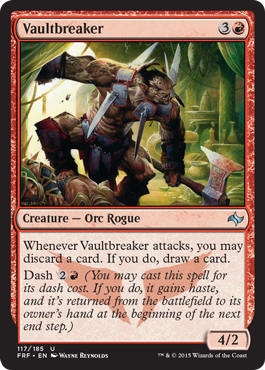 Vaultbreaker has dash. 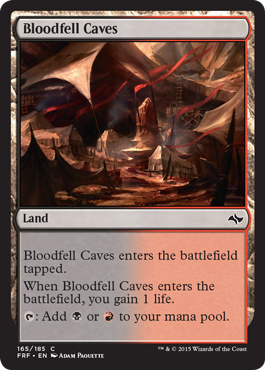 And it helps cycle lands or spells you don't want/need out of your hand for more useful spells/creatures. I like the name. And the burn combination seems good. Like I said the last three days... 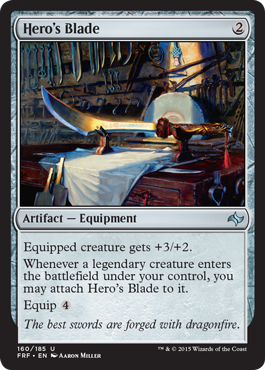 Hero's Blade is good with and without legendary creatures. Also like I have said three times before, a fatty with first strike and trample is a good fatty. 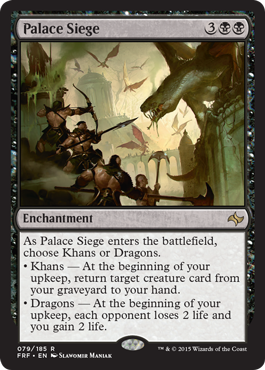 The Sieges just sort of seem best suited to the Mardu. Not sure why... 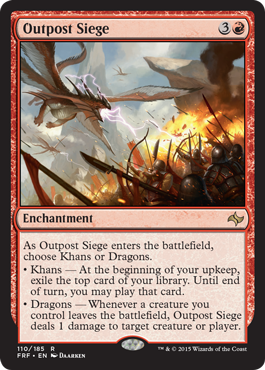 But all I'm going to say is Khans Dragons Dragons. Not necessarily, but those seem the most Marduish, if you will. 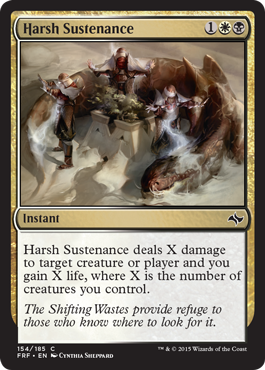 If you're swinging in with hasty first strike creatures, you're bound to still have a couple tapped. Bolster just makes them better. 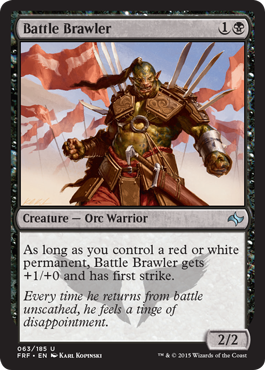 I like Brutal Hordechief. 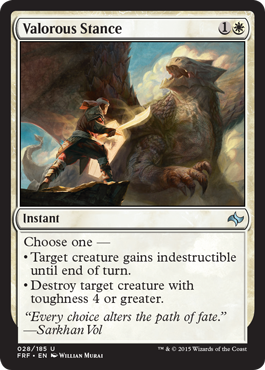 You can either get all the creatures to not block or direct them so they all die all while forcing your opponent to lose life. The Warrior theme is strong here. 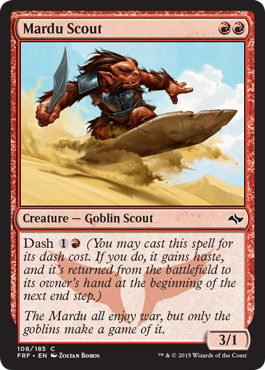 Make some tokens either by using Dash or waiting a turn and then attacking. 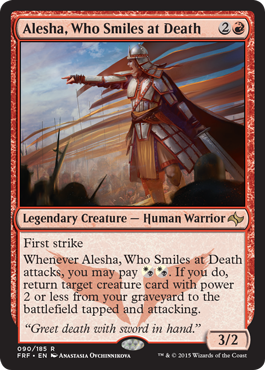 As the "old" Khan, Alesha is pretty good as a regular creature, but then she brings back some other creatures to the battlefield from your graveyard. 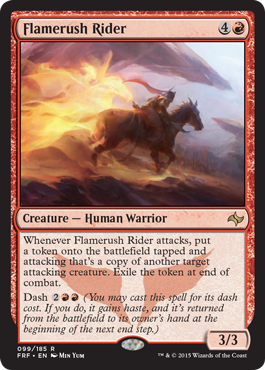 Flamerush Rider may cost a bit, but it copies already attacking creatures. 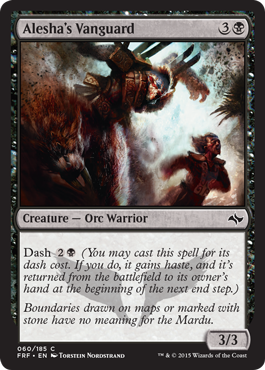 With Dash, you can cast it a turn early and get some extra damage in. 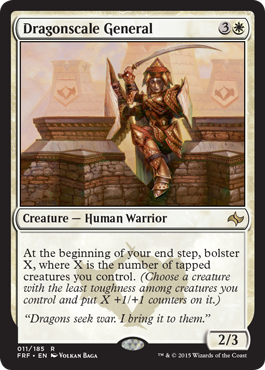 Kolaghan boosts your creatures, is a solid 4/5, and has flying so there is some evasion available. If you have one, play it. 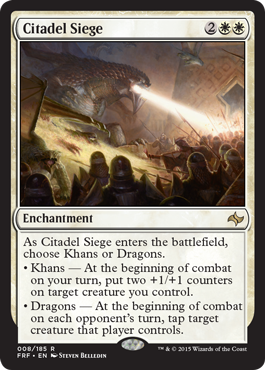 Well, looks like KTK will supply a good portion of your white common one mana creatures. 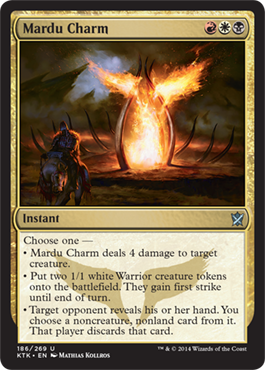 Both Firehoof Cavalry and Mardu Hateblade are solid choices for a Mardu limited deck. 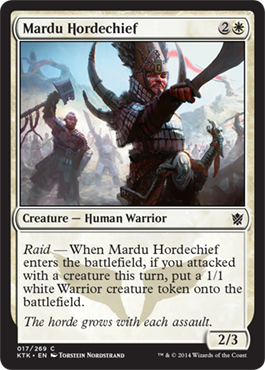 Mardu Hordechief gives more Warrior tokens. 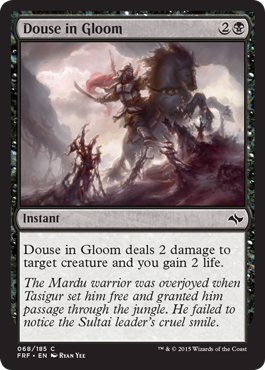 This will help with the overall Warrior theme found within the Mardu. Forcing discard is good. 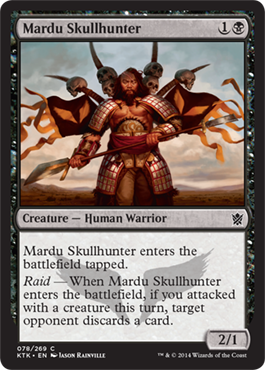 Gives a small advantage to you, so Mardu Skullhunter is a good creature to have. 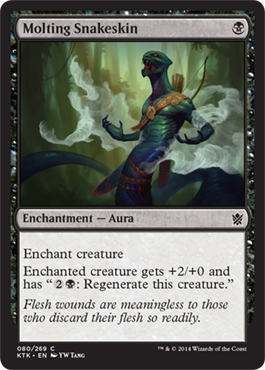 Molting Snakeskin is here for protection and boosting a creature that hopefully has first strike and/or trample. 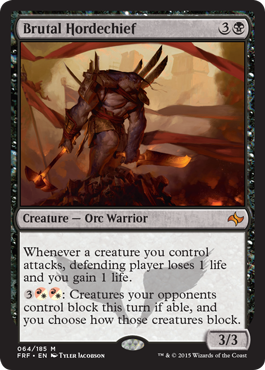 Raider's spoils boosts your creatures and also allows you to exchange life for cards if you have a Warrior creature. 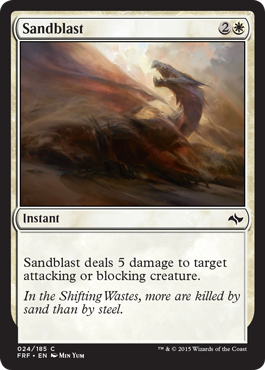 Damage, mana fixing, and haste on turn two. Seems good. 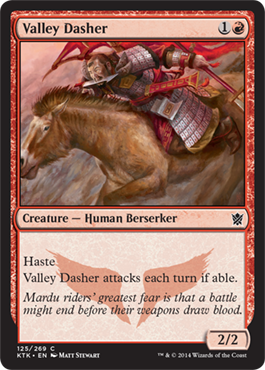 Join me tomorrow for the final segment of our prerelease primers where I visit the Temur.